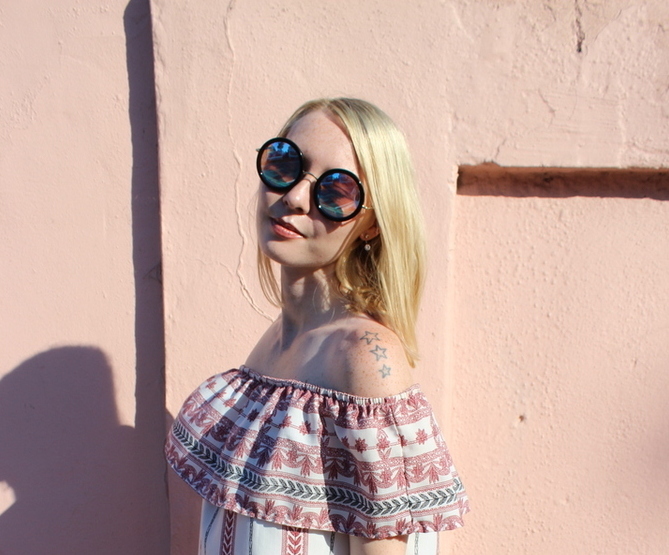 Asos is my go-to fashion forecast for everydamnthing and when off the shoulder dresses became inescapable last year I gained a new favourite summer style. The laid back look caught my eye and I'm so glad the trend seems set to stay. 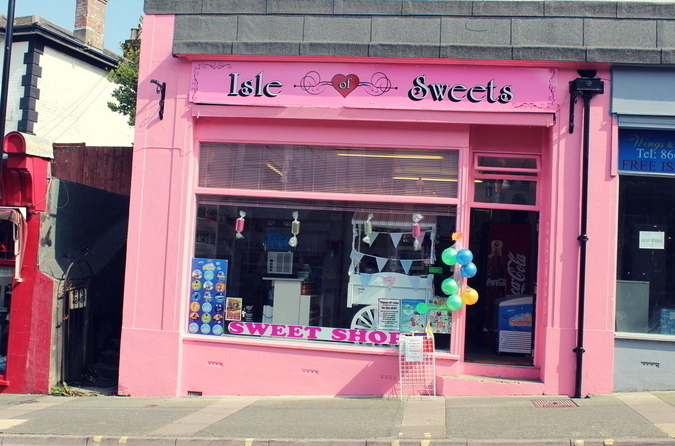 When I spotted this pretty punchy pink dance studio it wasn't quite one of those 'STOP THE CAR' moments but it was definitely close. 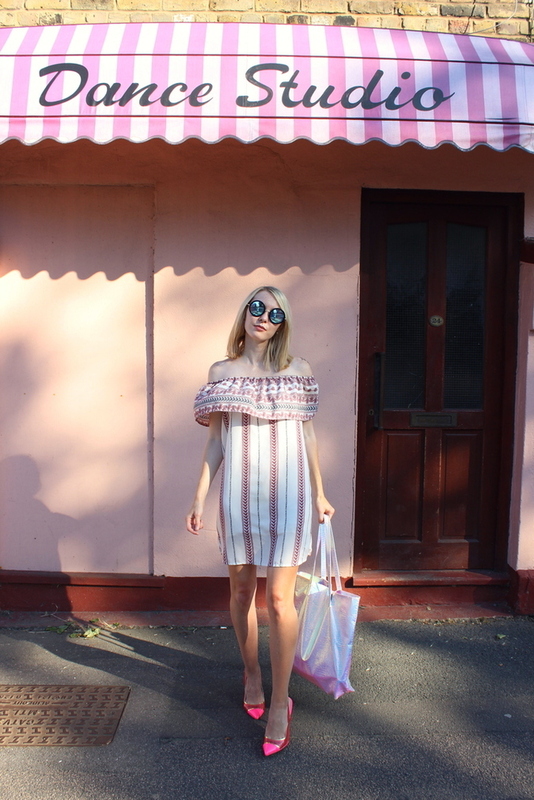 Instantly I thought of this off the shoulder festival dress from Asos, the ruffles and señorita style matching the dance studio vibe perfectly. The pink primp heels are also from Asos, you've seen them before in my Motel Rocks Metallic Rose post and Ice Cream Dreams OOTD. I loved them so much I snapped them up in white. Hopefully the glittery edge rubbishes the whole 'white stiletto shebang'. And as forever my holographic Asos beach bag tote is riding with me, because let's face it, what's a real outfit when it's not brimming over with beach anyway? Most importantly today is National Pink Day. Can I get an amen? And just when you feared your pink-o-meter might explode, it's also National Pink Flamingo Day. Say whaaaat? 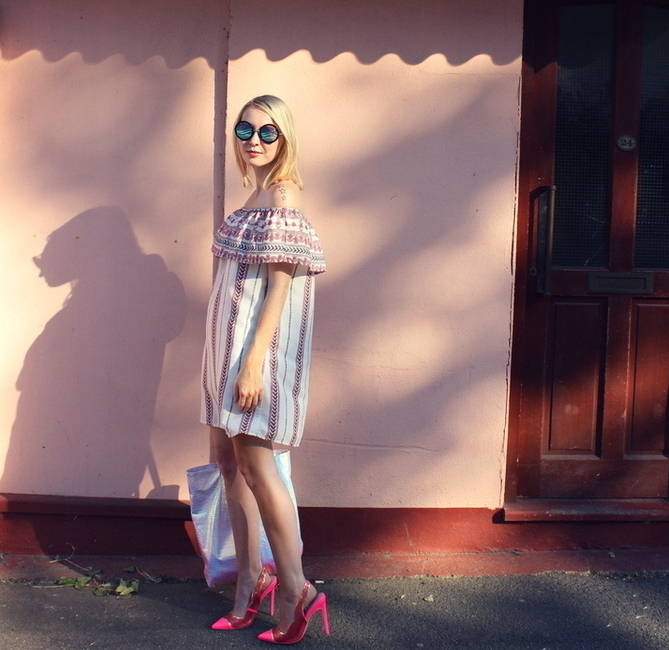 I've gotten a bit of a reputation for the colour pink, in truth I love the vibrancy and how I've been able to express myself and this blog through bright colours and summery hues. Since I turned my attentions to hotter hues and summer style, I've definitely found my niche and colourful call. Focusing firmly on the pink drink from Starbucks, I also told my mum we should go do a sassy shoot with some flamingos in honour of today. Unfortunately we never did get chatting to some for a collab but I think the dance studio was a happy medium, right? I love to seek out quirky little places that are unique for photoshoots. I'm happy we found this little treasure cove, I had it in my head that this outfit and the studio would be a match made in heaven and they truly are. In other news we saw the Baywatch movie and I can confirm it's every bit as life changing as expected (believe me I'm seeing it for the fifth time next week. Told you mum can't get enough of Zac Efron). I'd also highly recommend Gifted, such a heart-warming film that's one to catch for sure. I want to thank everyone so much for all the support and love on my last post. I can't even begin to tell you how much it meant from the bottom of my heart. I'd been holding back on talking about anxiety on the blog for a long time even though I'd wanted to and writing and hitting publish was just what I needed. It felt so good to be frank and open up and your kindness honestly floored me with gratitude. I've decided I'm definitely going to do more posts on anxiety and my experience with it as well as talking about other topics and issues in the future. I'll say it again, you babes really are the best! Will you be celebrating National Pink Day? 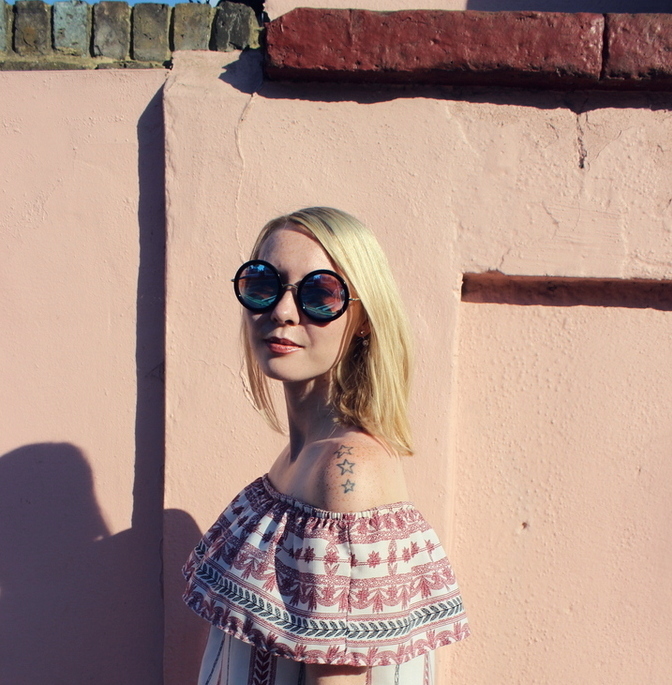 Do you love off the shoulder vibes as much as me? Wow! You look stunning in that dress! Great idea to combine it with these shoes! Definitely off the shoulder dresses and tops are my favorite. I love off-shoulders too but just never had the gut to go get one, worried that it might not look great on me. But it certainly looks beautiful on you! Love it! Your photographs are great and you look absolutely beautiful! This dress is gorgeous, thanks for sharing! The whole outfit is darling, the heels, the dress, you look gorgeous! Thanks for recommending the movie, it is definitely a must see with my sister soon. Also I love that you went with your mom, the best!!! I have to say that Asos has some of the best trends happening, and I feel that the quality of the clothes is really good as well. Love ASOS too! 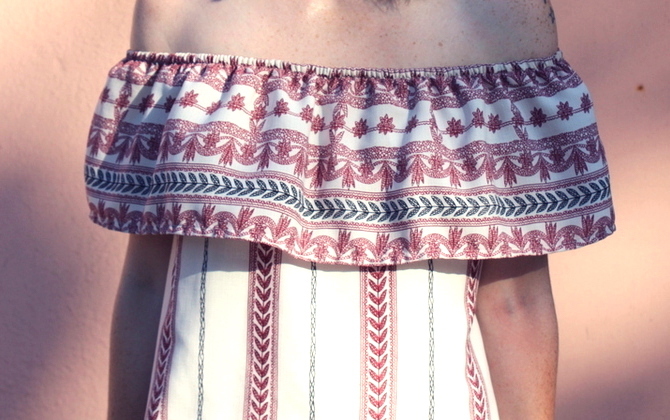 I love the pattern on this off the shoulder dress, so cute! I LOVE off the shoulder! And you pull it of amazingly (as usual!) - Also Soph, how do you manage to find these amazing spots to shoot! Absolutely lovely! I also really enjoyed reading your last post. Sometimes it can be the worst of the worst, especially when you think it affects other people - not knowing why you feel a certain way is so consuming. It's so difficult to look ahead and yet the positivity you shared in the post was so inspiring and uplifting to read. Never stop shining Sophie. So gorgeous look!! This shoulder dress is so gorgeous, right? You little stunner! This outfit looks great. How did i not know there was such a thing as 'national pink day'!! Amazing. Definitely a great match with the dance studio!